In Mid-August Thailand’s National Economic and Social Development Board published GDP figures for the 2nd quarter of 20161 – and they were impressive. The Land of Smiles’ production was up 3.5% on Q2 of last year, following on from a year-on-year increase of 3.2% in Q1. This is particularly indicative of the strength of Thailand’s economy for two reasons: its performance in comparison with major economies; and because the country has an export-oriented economy. For almost two years, production has been increasing at a faster rate than Australia and has recently begun to outperform the US (see chart 1). Chart 1 - Sources: NESDB, St Louis Federal Reserve, ABS. In this poor global trade environment, Thai exports have suffered, like those of most other nations. Exports from Thailand decreased slightly by 0.1% year-on-year to USD18,150 million in June of 2016 (but not as bad as market expectations of a 2.02% decline) following a 4.40% drop in May, marking the third straight month of year-on-year falls. Outbound shipments shrank to China (-11.9%), followed by Japan (-3.8%). However, in contrast, exports were up to the US (+4.7%) and Europe (+0.9%). From January to June 2016, exports increased by 5.8% in terms of price and 5.2% in value compared with the first half of 2015 (see chart 2). Although this was somewhat to do with currency values: for example, the Baht, in the first half of this year, was 6.4% stronger in H1 2016 than in H1 2015.5 In fact the volume of exports in H1 2016 was in fact slightly down (0.1%) on H1 2015 (see chart 2). Chart 2 - Source: Bank of Thailand. So against a very difficult multi-year backdrop, that worsened significantly during H2 last year when China’s slowdown started to have a greater impact,8 exports seem to have stabilised; yet they remain vulnerable and this puts pressure on the other drivers. Also the results are very impressive in view of Thai disinflation - there’s very little inflation component to the GDP growth. It’s much more akin to ‘real’ growth. Chart 3 - Source: Bank of Thailand. What’s more, the consumption component of GDP is also challenged – high consumer debt, especially in the lowest income quintile9 and also the lowest incomes facing headwinds because of this year’s drought conditions10 (remember around 42% of the Thai workforce is still in agriculture11) declined, so consumption contribution to GDP remains difficult and lower consumption12 and weak exports also constrain the private investment component of GDP. The two bright spots had been tourism and the public sector investment and expenditures. 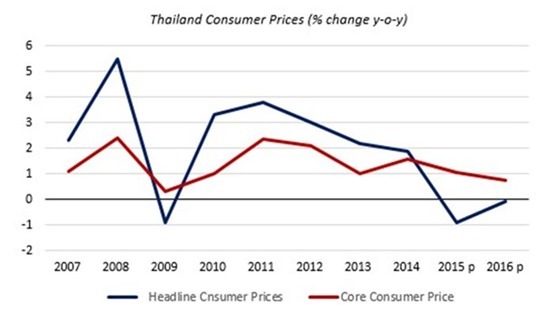 Although the stability expected following the referendum should be seen as a positive towards enabling the NESDB’s revised annual target of 3%-3.5% growth13 - which given that Thailand is currently experiencing deflation, is a real challenge. It should also allow the government to continue to focus on implementation of its infrastructure plan without too many distractions. However, the news of attacks in tourist areas that have left several people dead and scores injured since mid-August could be a real challenge to the tourism component unless this can be shaken off quite quickly. If not, that would be further pressure on public sector investment to raise GDP. Whilst the NESDB claims that the explosions are unlikely to affect economic growth,14 it’s far too early to know or even predict. On the bright side, the acceptance of the new constitution through the referendum, clears the path to implement a lot of the investment. The fear was that with a negative referendum result, there would have been distractions to the implementation of the investment plan. That dependency on two main variables means, despite the relatively good results, we cannot too carried away. 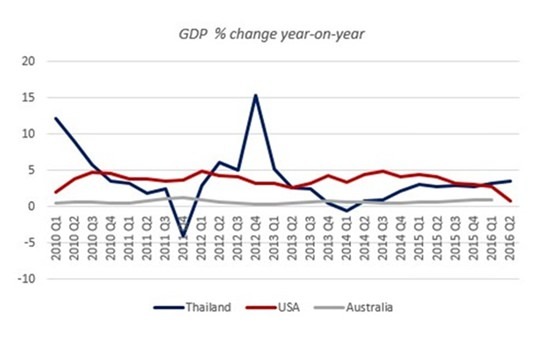 Thailand: Solid GDP results – but can they continue?